After joining the E.U. in 1986, the Spaniards started to rebuilt their country with a bit of help from the European Union. In the 90's, they revamped their own image and experienced a serious increase in both tourism and real estate markets. The first decades of the 21st century (which isn't even finished yet) saw the implosion and explosion of the Spanish's culture, food and wine. As of 2009, Spanish wines remain in the top tier of the most selling wines in the US market. As Spain's winemaking revolution flourished, one of the emerging hot spots was Jumilla. Jumilla is a small appellation located central-eastern Spain near Yecla and roughly 60-70 kilometers west of Alicante. Jumilla was one of the few places in Europe spared during the Phylloxera epidemic of the late 1800's. Virtually everywhere on the continent, vineyards were devastated and, to this day, can only be planted on grafted hybrid-American rootstock (more resistant to the Phylloxera insects). For Jumilla, the key to its vineyards' survival was their sandy soil - which is anathema to the Phylloxera insect. And as a consequence, today Jumilla not only has some of the oldest vines in Spain, but certainly the largest number of ungrafted vines. 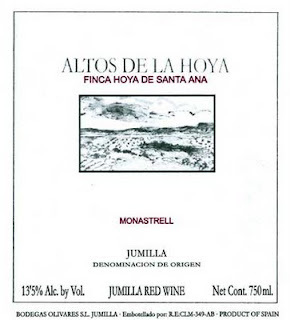 Most of the region is planted to Mourvèdre, locally know as Monastrell. Jumilla's summers boast hot days and cool nights, resulting in fantastically ripe grapes with good acidity. Bodegas Olivares's vineyards are in the northernmost zone of La Hoya de Santa Ana. This is the coolest subzone of Jumilla, with sandy, lime-rich soils that produce intensely aromatic wines. The robe is quite dark, medium intensity, ruby hue. The nose is earthy, dry and a touch floral with dark berry aromas. The attack and mid-palate are quite juicy mixing ripe red and dark berries with earth, spice and almost garrigue-like flavors. The finish is dry, earthy and slightly spicy with dry tannins. Overall, this wine is a good quaffer, bistro-isch juice in a bottle. It definitely needs a bit of food, like tapas, "hors d'oeuvres" or "charcuterie". Pleasant, simple and a bit rustic yet easy going. The tannins can use a bit of time but food will help mask them and round up the finish. You've probably tried many Albariño from the "Rias Baixas" and other regions of the north western part of Spain, in Galicia. But did you ever try an Alvarinho from the Vinho Verde region in the "Vinho Regional Minho" appellation, Portugal? 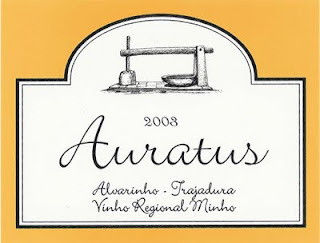 Probably not, so here is one that you should try: 2008 Quinta do Feital "Auratus" Alvarinho-Trajadura. But before I describe the wine, here is a little explanation about the appellation and the region: Vinho Verde is a Portuguese white wine (but also a region of the same name) produces in the Minho region, located in the far north-western part of Portugal, along the Minho river which is the natural boundary between Spain and Portugal. Vinho Verde is located on the south bank of the Minho river, in Portugal, opposite to the "Rias Baixas" appellation in Spain. The name literally means "Green Wine", referring to its youthful freshness rather than its color, altough certain wines may have green-isch reflects. Vinho Verde wines are light and fresh, and are intended to be drunk within a year or two after bottling, the fresher the better (like Txakoli wines in the Basque country). Although, they do not quite qualify as semi-sparkling wines, they do have a definite pétillance or slight pearling on the tongue. Very fresh and summery, due its natural acidity, Vinho Verde is usually dry yet fruity (and I do not mean sweet for the 1,000th times) with floral and mineral aromas, more or less distinct and concentrated depending on the blend, the different grape varieties that constitute the blend and of course the syle of the winemaker. Although, it is more common in the US market to find white Vinho Verde, the region and the diverse appellations and sub-appellations also produce some Rosé(s) and some red(s). A few examples of the Rosé are quite popular in New York, like Casal Garcia Rosé; the red are less known and not always available in the US market due to barely existent demand. Vinho Verde white wines are pale yellow lemon colored, around 9 to 11% alcohol, and are made from local grape varieties: Loureiro, Arinto, Trajadura, Avesso and Azal. Vinho Alvarinho is made from Alvarinho grapes, from the small designated sub-region of Monção. It has usually more alcohol (11.5 to 14%) with riper fruit and aromas. The reds are fairly intense and tannic with good acidity, and are mostly made from Vinhão, Borraçal and Amaral grapes. The rosés are very fresh and fruity, and usually made from Espadeiro and Padeiro grapes. The fruit comes from a newly purchased estate in Seixas planted with old vines Trajadura and young vines Alvarinho. Trajudura is a relatively obscure white grape used, in this case, to add body to the wine. The Portuguese "Vinho Regional Minho" appellation is the equivalent of a French regional "Vins de Pays". The 2008 vintage was quite difficult with ripening problems due to rainy climatic conditions and definitely not as harmonious and expressive as the 2007 vintage. Therefore, the winemaker has to leave the grape macerate for a longer period in order to increase the skin contact to extract a maximum of flavor and structure. Fortunately, the old vines of Trajadura really add texture to this Alvarinho in 2008. Moreover, the estate only farms organically and only used wild, indigenous yeast, which usually add an extra dimension, more character and layers of complexity. So despite a difficult vintage, the 2008 Quinta do Feital Auratus Alvarinho-Trajadura Vinho Regional Minho is quite crisp with a clean, focus palate and beautiful aromatics! It has a pale yellow, gold-like color, with golden reflects. The nose is clean, fresh, inviting, mineral and attractive with aromas of white peach, white flowers, citrus peel and more mineral. The palate is quite rich, expanding, viscus, yet fresh with vivid, needed acidity and beautiful balance. The fruit flavors are bright and racy yet ripe and generous, well rounded with excellent texture and length. Although I loved the 2007 vintage, I personally found the 2008 to be really good too and very consistent. Versatile, dry, fresh and easy drinking, yet with a bit more fruit, substance and depth than you regular Vinho Verde, you should compare this wine with some of the best Albariño from Spain rather than comparing it with its inexpensive Vinho Verde sibling. Fish and shellfish will nicely complement this wine, and Vice Versa. Drink more Bio and Organic wines (and food) from sustainable cultures and respect the environment! Calabria, in antiquity known as Bruttium, is a region in southern Italy, south of Naples, located at the "toe" of the Italian peninsula. Gaglioppo is a red wine grape that is grown primarily in Calabria, the south-western region of Italy. The grape is of Greek origins and is thought to have been introduced to southern Italy around the same time as the Aglianico grape. Performing well in the dry, aride and drought conditions, the grape usually produces full-bodied wines, high in alcohol and tannins and usually quite age worthy, a decantation will soften the wine. It is sometimes blended with up to 10% white wine to bring more acidity and freshness. Made from Gaglioppo grapes planted on medium-textured, stony soils with warm, mild, well-ventilated Mediterranean climate, this Gaglioppo rosso is one of the Statti company’s trump cards. The Statti team is working assiduously but without any undue hurry on its studies of this ancient variety, which is symbolic of the Greek origins of viticulture in Italy: they prefer to take one step at a time, so as to be able to give the best possible interpretation of the discoveries that research reveals, vintage after vintage. This is a wine for drinking whilst still very young and fruity; it can also be enjoyed with fish. 2008 Statti Gaglioppo Rosso has a very light to medium, bright ruby color, Pinot Noir-Lagrein-isch in color, with a pink hue. Quite expressive, the nose is earthy and dry, yet fresh and fragrant with ripe dark cherry aromas mixed with smoke, mineral, touch floral (some violet), spices and pepper touches. The attack is lovely and juicy with bright red cherry and high acidity, touch of smoke, spice and pepper. The mid-palate is quite dry and light to medium intensity, and expands nicely with juicy red wild berries fruit. The finish is definitely dry, slightly rustic and esoteric, with present tannins yet enjoyable overall. Here again, not necessarily your everyday wine, but in the same time interesting and intriguing, with a certain finesse and subtitle layers. Definitely need food to complement some of the angularities yet the juicy fruit will balance most of them, and despite its light and lean color, a true adventurous connoisseur (like me) will surely enjoy and appreciate this light to medium bodied great red concentrated with flavors. I love it. Pair it with flavorful, spicy or peppery food. C.V.N.E (Compaña Vinicola del Norte de España) aslo known as "Cune" is producing many wines from diverse locations and Bodegas. Created in 1879, CUNE is the original Bodegas. It used to be a cooperative handling the grapes of many growers in the cellars located in "Barrio de la Estación de Haro", in the village of Haro (Rioja Alta). CVNE is now divided in three Bodegas making many diverse wines. Bodegas CUNE produces the following labels: Cune, Monopole, Imperial, Corona and Real de Asúa. Bodegas Contino (one of my favorite Bodegas in Rioja), considered and vinified like a 1st growth from a single plot vineyards surrounding the beautiful estate (read my previous post on Contino), produces: Contino, Viña del Olivo and Graciano. In 1920 the first Viña Real wines were launched. These wines were produced from grapes grown around Elciego, in the heart of the RiojaAlavesaprovince. These vineyards, to this day are still controlled by ViñaReal and continue to border the ‘Camino Real’ or ‘Royal Drive’; hence the origin of the ViñaReal name. The ViñaReal wines are modern in structure, balance and elegance, with a potential for very long aging in bottle, this last being the main characteristic of the Rioja Alavesa province. Viña Real, which was completely and beautifully refurbished recently, is a bodegas located on Cerro de la Meso hill, not so far from Contino (Rioja Alavesa). If you've ever been to Château Lafite Rothschild in Pauillac (Bordeaux, France), you will realize that the brand new cellar of Viña Real has been conceived with the same kind of architecture, its grandiose! Vina Real produces great wines, more classic and traditional in a way than Imperial (more Bordeaux style) and Contino (more opulent, riper and oakier yet refined). The usuals: bianco, crianza, reserva, gran reserva and their grand cuvée: Pagos de Vina real. This wine was elaborated with hand harvested grapes coming from vineyards surrounding the winery, in Rioja Alavesa. After the cold pre-fermentation maceration, the fermentation alcoholic happened in temperature controlled stainless still tanks to maintain the true varietal character of the different grapes. Part of the malolactic fermentation occurred in barrel. Viña Real Reserva 2001 was aged for 22 months in 50% French and 50% American oak barrels, period during which the wine acquired all its structure, finesse and character. At the end of the aging period, after a light filtration with egg whites, the wine is bottled and stored for 2 more years in bottle before release. A blend of 90% Tempranillo, 10% Garnacha and 5% Graciano & Mazuelo, from the excellent and definitely age worthy 2001 vintage, the Viña Real Reserva is a fantastic wine. In the glass, it exposes an attractive ruby red color, medium to good intensity, with light touches of brown on the rime. Clean, quite intense and expressive on the nose, with ripe red cherry, autumn fruits, spices and elegant toasty oak. The palate is the real delight, rich and generous yet balanced and juicy, velvety, with lifting acidity and integrated tannins. The toasted, vanilla oak notes complement beautifully the red cherry and raspberry fruit characteristic of the Tempranillo grape, producing a fine, rich, complex palate with a lingering finish. The wine is really well balanced and attractive now, yet it still has good potential to improve even further more. Have it with grilled Chuletas de Cordero (lamb chops). Champagne is a small sparkling wine region located approximately 140-150 kilometers east of Paris, predominantly surrounding the town of Reims, the Champagne capital, and expanding partly east toward the town of Chateau Thierry and partly south toward the town of Ay and Epernay, the little village Vertus and further south to the town of Troyes. Montagne de Reims roughly forming a "U" shape toward the south around the town of Reims where some of the best Pinot Noir vineyards can be found. Vallée de la Marne extending from east to west and following the Marne River between the town of Epernay and the western part of Chateau Thierry, where some of the best Pinot Meunier vineyards are planted. Côte des Blancs starting from Epernay and going down south toward Vertus, home of the best Chardonnay grapes. Champagne is a sparkling wine produced by inducing, after the 1st fermentation alcoholic, a second fermentation in the bottle by an addition of yeast and sugar, creating some carbon dioxide which can't escape from the bottle, thus creating carbonation: bubbles. Pressing (a.k.a. Pressurage): right after harvest the 3 Champagne's grapes (Chardonnay, Pinot Noir and Pinot Meunier) are gently pressed. Depending on the Champagne house, the pressing of the grapes can be different, but on average 4000kg of grapes will result in about 2550L use to produce quality Champagne (2050L of Cuvée - tête de Cuvée and Cuvée de Reserve - and 500 of Taille) the remaining liters left over from the pressing will be use for distillation and production of Marc de Champagne. Roughly, it takes about 1.2 kg of grapes to produce a 750cl bottle of Champagne. Alcoholic fermentation: the fist steps in the production of Champagne are very similar (or should I say identical) to white wine. Chardonnay, Pinot Noir and Pinot Meunier's grapes are gently pressed then fermented, usually separately, but sometime together, depending on the producer's style, need or intuition depending on the vintage. Like for white wine, the conversion of natural sugar (contained in the grapes) into alcohol usually occurs because of natural (and sometime added) yeasts, the grape juice turns then into still white wine. The malolactic fermentation is not always used and especially not if the natural acidity of the grape juice is low. 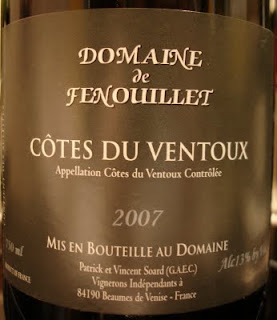 Before assembling the wines, the wines are usually "refrigerated", technically the temperature is lowered is the stainless steel tanks, to provoke the "Acid Tartaric Precipitation", and this way avoiding the formation of tartaric crystals in the bottle when put in the fridge just before consumption. Assembling the wines: as you may already know, most Champagnes (except the "Millésimé" better known as "vintage") are Non-Vintage (NV) and mostly "Brut" (dry), for the simple and understanding reason that they are made from wines of different vintages. For those of you who do not understand what I'm trying to say, let me explain: in order to respect the consistency, taste, balance, characteristic and style of their Champagnes (NV), vintage after vintage, and more especially year after year, the different Houses of Champagne have their own blend made with, predominantly, the gape juice of the latest harvest completed after ageing and disgorgement, with a touch of the "Cuvée de Réserve" or "Reserve" during the Dosage phase, usually a wine from the recent past years. More over, the blend between Chardonnay, Pinot Noir and Pinot Meunier may vary in quantity depending of the vintage and the desired style (Rosé, Blanc de Blancs, Blanc de Noirs, etc...) but also in quality depending on the provenance of the grapes, especially for the Houses of Champagne that traditionally continue to buy their grapes with the local growers located either in the Grand Cru vineyards (usually the best, selling their grapes from a higher price and considered 100%) or the 1er Cru vineyards (although, considered 99%, supposedly lower in quality with less expensive price for the kilo of grape, yet still excellent). Which explains why a bottle of Krug or Salon or Gosset or Bollinger or Billecart Salmon or Ayala or , in the case of this post, Marc Hebrart "Brut Non Vintage" taste pretty much the same year after year. In Champagne, being a Champagne maker and expert blender, like Richard Geoffroy at Dom Perignon, is not an easy task and requires refined blending skills and an accurate, very consistent palate, because, for the reasons cited above, different wines from different grapes and different areas and Terroirs are blended together to obtain a consistent Champagne that need to have the same taste, style, quality and characteristics year after year (that is also the best way for the Champagne Houses to keep their identity, their reputation and more importantly their consumers: because, even if sometime, consumers may try different Champagnes, other than the one that they like to drink the most, for different reasons, at some point, they will always come back to the one that correspond the most to their style, their envy and more especially their palate). Bottling and secondary fermentation (also called "Tirage" phase): usually happening in January, after the first alcoholic fermentation and the assembling, the desired assembled (or blended) wines are bottled with an addition of yeasts and sugar (also known as "Liqueur de Tirage"), slowly starting a second alcoholic fermentation in the bottle and creating some carbon dioxide which can't escape and dissolves in the bottle, thus creating carbonation: bubbles (also known as "Prise de Mousse"). The fermenting wine must remain by Champagne's law a minimum of 1,5 year in the bottle before disgorgement. Some Champagne House, depending on the desired style and taste, left the obtained Champagne for longer on its lees and yeast residues which confer roundness, viscosity and somewhat richness to the final product. The Champagne bottles slowly fermenting are closed (or sealed) with a beer-like metal capsule and a plastic "Bidule" (small plastic recipient placed against the capsule inside the neck of the bottle) to collect the lees and yeast residues and to facilitate the disgorgement. Maturation: Champagne are usually stored on wood standing "Palette" or rotating palette located in the multiple corridors carved in Champagne's famous chalky soils, creating kilometers of labyrinth and cavities where the Champagne can mature and age in perfect conditions. Traditionally, the bottles are stored horizontally to start with, on standing palettes made of wood, then they are manually, consistently, carefully and gently rotated a few times a day by skilled "rotaters" (skilled bottle rotating people, usually the cellar master and his assistant) and in the mean time gently and gradually inclined to gather the yeasts and lees residues toward the neck of the bottle. By the end of the maturation process, after a minimum of 1,5 year for non vintage and 3 years for "Millésimé", the bottles are usually up-side-down and the residues form a layer of about less than 1 inch against the capsule (in the "Bidule"). Technology has evolved and production, cost and demand eventually triggered the birth and the need for "rotating palettes", machines which rotate the bottles instead of men, often used for faster results in generic champagnes from big brands and other quantity Champagne Houses and lower quality sparkling wines production. Although, the difference in quality hasn't really been proven, the nostalgic and more traditional way of storing the bottles on wooden palettes in the dark, moist chalk cellars for 2-3 years remains the method of choice in most classic Champagne houses. Disgorgement (or Dégorgement): Once the bottles have mature to ideal time (depending on the Champagne house between 1,5 to 3 years and more) and are also inclined enough to have all the lees and yeast residues in the neck of the bottle, against the capsule, the Cellar master can proceed to the Disgorgement (or Dégorgement). Before 1816, Champagnes were made following the original method, also called Méthode Ancestrale (which by the way still exist and still in use for certain style of sparkling drinks in certain countries), and were cloudy because disgorgement, a method invented by Madame Clicquot, didn't exist. The old method of disgorgement (also called "Dégorgement à la volée") consisted for the cellar master and champagne maker to quickly yet carefully and skillfully manually open, with a special tool, every single bottle (one after another) and thus evacuate (with the pressure contained in the bottle) the unwanted lees and yeasts residues accumulated in the neck of the bottles. Although very efficient, this method was somewhat imprecise due to the amount of Champagne lost and the additional "Liqueur de Dosage" varied from bottle to bottle, allowing a certain inconsistency yet nothing really major, but at that time some bottle may surely have been better than other (or at least tasted slightly different). The new method, brought by researches, experiences and new technology, is roughly the same and consists to plunge the neck of the bottles in a liquid (called Brine) that will freeze the lees and yeasts residues. The formed plug of ice containing the lees and yeasts residues is then removed, also by pressure, without losing much Champagne (at least, less than the previous method). Once opened after disgorgement, the bottles need to be immediately closed after the addition of the "Liqueur d'expedition" during the Dosage phase. Dosage: immediately after disgorgement, in order to refill the bottles and especially close the bottles to avoid oxidation, keep consistency and quality, and determine (or obtain) the desired style, a "Liqueur d'Expedition" (a blend of sugar and vine) is added, also because all the residual sugars have been consumed during both fermentations and the Champagne taste will not be as pleasant without this addition of sugar. The amount of "Liqueur d'Expedition" varies depending on the final, desired style and taste and will determine the "Dosage" of the final produce: e.i. a Champagne "Brut" will contain less sugar than a "Demi-sec" or "Extra-Dry" (yes, I know it is confusing, but it is how the British defined it at first and it stayed with tradition, "Extra-Dry" should be dryer but for Champagne it is the opposite, it is sweeter...go figure). Corked: right after the Dosage phase (addition of the "Liqueur d'Expedition"), the bottle are securely corked with a "Muselet" (or cage) to avoid accidents. The quality of the cork is essential to maintain the quality of the Champagne. The final products will then rest for a certain period of time (depending on the Champagne House) before release. For more info about RM, NM, etc...and the other different types of Champagne houses, read my previous post on Champagne and other sparklings. FYI: By the way, the Champagne cork, the form of the Champagne bottles and the chalky naturally temperature controlled underground cellars were also developed around Dom Perignon's time, during the 17th and 18th century when the monk of the Champagne area discovered (or re-discovered depending on the source) roughly everything at the same time and were forced to find a solution: basically, during the second fermentation not appropriate and not well attached corks were flying all over and bottles were exploding due to the pressure but also due to external temperature too, eventually after multiple attempts and experimentation, the right bottle shape and the right cork were found and used. The natural and constant cool temperature of the human carved chalky cave underground constituted the perfect maturing place for Champagne and sparkling wines in general (but still wines too, take for example the cellars of Saint-Emilion). As a matter of fact, like in Bordeaux, most Champagne houses were built with rectangular sculpted chalky stones carved out directly from these caves. Moreover, the traditional Champagne method, also called "Méthode Champenoise", is known since the 17th century. Although he didn't really discover it but yet was a quality pioneer in sparkling wine who developed it and somewhat perfected it, this method was attributed to "Dom Perignon" a Benedictine monk from the "Abbaye de Hautvillers" (north of Epernay). In fact the British were the first to study, understand and appreciate the desirable and attractive trait of Champagne and its bubbles. Champagne is produced exclusively within the Champagne region of France, from which it takes its name. And because of now established international treaty, national law and quality-control/consumer protection related to local Champagne regulations, the name of "Champagne" can only be used for the wines produced in the Champagne appellation. In Europe, this principle is enshrined in the European Union by Protected Designation of Origin (PDO) status. Other countries, such as the United States, have recognized the exclusive nature of this name, yet maintain a legal structure that allows longtime domestic producers of sparkling wine to continue to use the name in certain circumstances. But otherwise, it is forbidden to call a sparkling wine produced else where than Champagne to be called "Champagne". In France, sparkling from other regions may be referred as "Mousseux" or "Crémant" or "Pétillant" (depending on the method). Other sparkling wines from other countries may mention on the label "Méthode Traditionnelle", or Traditional Method, or if the method is different, one may read "Méthode Charmat" (Charmat process or method), "Méthode Ancestrale" (ancestral method), "Spumante", "Frizzante", or even "Sekt". In fact, it is still possible to find, in the US market, wines bearing the names of famous Appellations because during the early 1930's, most of the French wine regions' names were not well protected. Names like "Chablis" and "Burgundy" from California, for example, have absolutely nothing to do with the original names or appellations. Despite the fact of bringing more regulations about what it is possible to do or not to do for producers and growers within the limits of an appellation, the INAO ("Institut National des Appellations d'Origine") and the AOC ("Appellation d'Origine Controlée") were created in 1935 to defend and protect the name of the different Appellations and their wines against fraud and counterfeit, and especially to limit the used of them. Champagne is a festive, bubbly, fresh and delicate drink suitable for any occasion and celebration: birthdays, weddings, communions, births, new contracts, new jobs, leaving a job or a place, complementing a brunch, a lunch or a dinner, etc... Champagne is a great treat, versatile and airy, it will surely sparkle your mind and your mood. Marc Hébrart is a fairly new, exciting producer from the Vallée de la Marne, producing really enjoyable Champagnes from about 12.5 hectares of vineyards planted on chalky, limestone soils with mostly 75% of Pinot Noir in the great 1er Cru vineyards of the villages of Mareuil-sur-Aÿ, Avenay-Val-d’Or and Bisseuil, complemented by 25% of Chardonnay from the Grand Crus Chouilly and Oiry in the Côte des Blancs. Marc Hébrart winery is located in the underrated village of Mareuil-sur-Aÿ, a 99% villages considered 1er Cru and home of another one of my Champagne Rosé: Billecart-Salmon. Jean-Paul Hébrart, the current owner and winemaker, somewhat inherited of the property from his parents, Marc Hébrart and his wife, who started making Champagne in 1963. Due to the high price of the land in Champagne, they slowly and gradually bought and planted more vineyards. In 1983, their son, Jean-Paul started is own little production. In 1997, to keep and secure the lands within the family, Jean-Paul and his parents created a company (E.A.R.L Champagne Hébrart) by merging the two enterprises together, subsequently Jean-Paul became the director of this little family run company. Marc Hébrart Champagne is a Récoltant-Manipulant (RM), meaning that the Champagne house owns its own vineyards and produces Champagnes only with their own grapes and do not buy any grapes from other growers. Jean-Paul Hébrart is somewhat a purist and a traditionalist, who prefers applying natural methods in the cellar but also to the soils and vineyards rather than using unnatural products like pesticides, herbicides, etc.. Hand selected and harvested grapes, Bucher pressing, fermentation in "petite cuvée", malolactic and hand remuage. Hébrart represents a departure from the other producers in this portfolio, for Jean-Paul’s wines marry the top Pinot Noir sites of the Vallée de la Marne with Grand Cru Chardonnay sites in the Côte des Blancs. From Skurnik point of view, Hébrart is more similar to the philosophy of Gimonnet than to that of Larmandier-Bernier, for the connoisseurs who also know these two producers. Hébrart’s wines are buoyant and lithe with deft integrations of minerality and juicy fruit, with excellent balance, acidity and length. 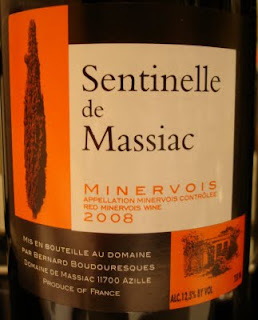 Disgorged in December 2007; it was made with wines from the excellent 2005 vintage, completed with the still Mareuil red (10%) coming from 2004 vintage. The base is half-half Chardonnay and Pinot Noir, and all the Chardonnay come from Grand Cru vineyards. 2005 is one loveable vintage, offering both-solid-and-ethereal wines, with great clinging fruit and a silvery aurora of chalk that almost sizzles on the brilliant finish. Over the last 2-3 years, I tasted Marc Hébrart Rosé in many occasions and it rapidly became one of the favorite "Champagne Rosé" of my wife and I, with Billecart-Salmon Rosé and Laurent-Perrier Rosé. The last time was for the 3rd birthday of my son last week-end, and once again, it was a wonderful experience. 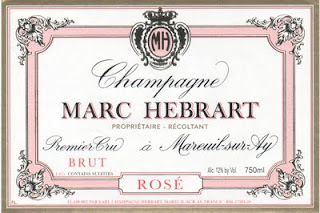 NV Marc Hebrart Brut Rosé 1er Cru Champagne has a light, pale salmon, pink color with captivating reflects and is already pleasing to observe in the glass. The nose is fresh, clean, delicate, mineral, floral and inviting. The palate is quite impressive, somewhat light, delicate and almost fragile in the attack yet expanding nicely in the middle palate with light raspberry and vivid red berry flavors complemented by rose petal, floral notes and lifted by a great, racy acidity. The lingering finish is quite dry with dry red cherry and raspberry notes. Overall, it is a well crafted, very feminine Champagne with a complex and seductive yet friendly and approachable attitude. I loved it everytime I tasted it, and this last time was no exception. Highly recommended for the lighter, less rich and yeasty, yet sophisticated and balanced Champagne's lovers.